Angela Merkel has said she will stand down as German Chancellor when her current term comes to an end in 2021. 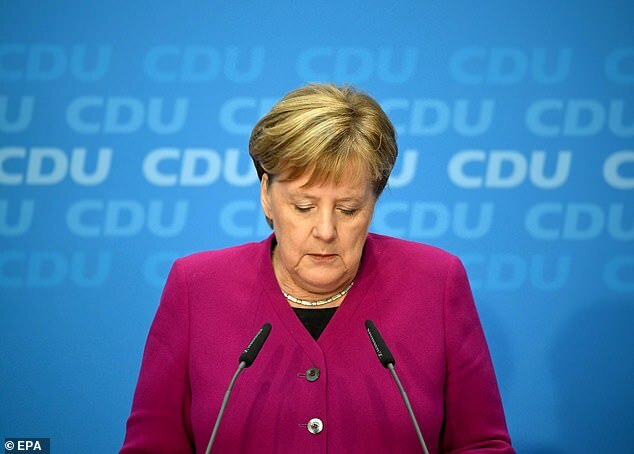 Merkel, who has held the office since 2005, said her government had lost credibility after a bruising election result in Hesse at the weekend, which saw the CDU emerge victorious but drop almost 11 points at the polls. She will also quit as leader of the CDU, a post she has held since 2000, in the coming days, with a new leader due to be elected at party conference in December. 'I will not be seeking any political post after my term ends,' Merkel said, bringing an end to her career after more than a decade at the top of German politics. She added that she accepts 'full responsibility' for weakening party support, which comes in the wake of the migrant crisis. 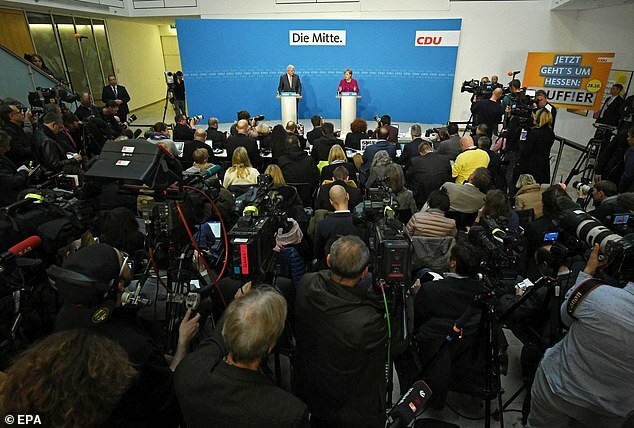 Merkel told a news conference that it is time to 'turn a new page' following a string of ballot-box setbacks that started with the general election in 2017, when the CDU haemorrhaged support to anti-migrant party AfD. It took Merkel months to form a grand coalition government with the SPD after that result, and the alliance has been plagued by infighting and instability ever since. 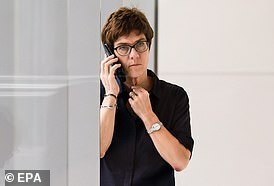 The current secretary general of the CDU and a close ally of Merkel, aides have said Kramp-Karrenbauer is eager to take over from her as leader of the party in December. She previously served as the Minister President for the state of Saarland, increasing the CDU's vote there in 2017 even as it fell nationally. Spahn currently serves as the Health Minister and has advocated pulling the CDU further to the right from Merkel's centrist approach. He has sparred with Merkel in the past and has taken a hard line over immigration, which has become a losing issue for his party. Merz, a fierce and longtime critic of Merkel, was the first name to emerge as her possible replacement. A former member of the European Parliament, Merz also previously served as the chairman of the CDU/CSU parliamentary group until he was replaced by Merkel in 2002. He left the Bundestag in 2009 and now sit on the board of several prominent companies, including the German arm of BlackRock. The parties were humbled in elections in Bavaria earlier this month before the beating in Hesse, which Merkel said should act as a 'wake up call' for her coalition. 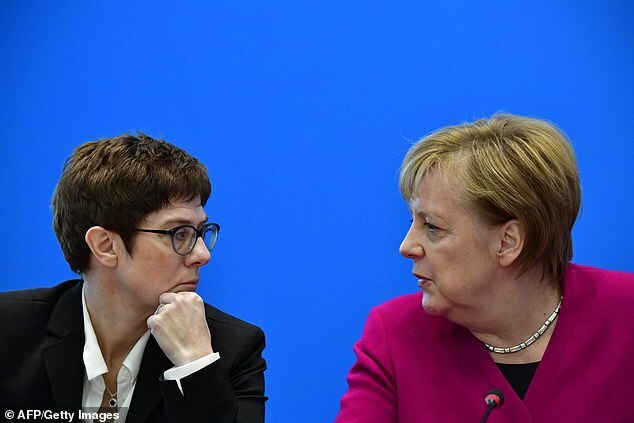 Handing over the reins of the CDU to a successor presents 'many more opportunities than risks', she said. She added that she made the decision over the summer and had intended to announce it next week, but brought the date forward after the result in Hesse. She has also ruled out running for a senior EU position in the future. 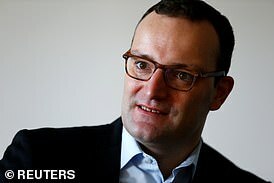 Speaking about who might replace her as CDU leader in December, Merkel confirmed that Health Minister Jens Spahn and CDU General Secretary Annegret Kramp-Karrenbauer are in the running, but refused to state a preference. She did not comment on rumours that Friedrich Merz, who served in the Bundestag until 2009 but is now in the private sector, will also be putting himself forward. 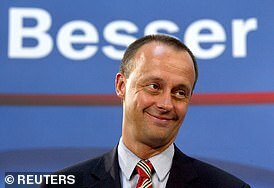 Merz was parliamentary leader of the CDU/CSU alliance from 2000 until 2002 and also a member of the European Parliament. He now serves as chairman of BlackRock Germany. This comes as she is been facing calls to quit from her own conservatives to cede the party's leadership today, further eroding her authority after painful losses in a regional election. Merkel's CDU came first in Sunday's election in the western state of Hesse but support fell by more than 11 points, reigniting a succession debate by conservatives unhappy with the chancellor's grip on power. She also faces pressure from her Social Democrat (SPD) junior coalition partners, who have also bled support in Hesse and are under pressure to rethink their alliance with Merkel. SPD leader Andrea Nahles, whose party saw support fall to its lowest since 1946, threatened to end the alliance with Merkel's conservatives if there is no improvement on policy. Merkel, chancellor for 13 years, will have to invest her political capital and tactical acumen to keep together her loveless coalition, borne out of necessity seven months ago after an inconclusive federal election last year. This will distract her from tending to major challenges at home and abroad - ranging from overcoming a digital deficit and pushing the German car industry toward cleaner mobility to seeing through euro zone reforms and managing Britain's planned departure from the European Union. 'The election results show that people expect renewal from the CDU,' conservative lawmaker Matern von Marschall told the Stuttgarter newspaper. A senior CDU member told Reuters that party leaders wanted to discuss the possibility of Merkel reversing her decision to seek re-election as party chairwoman in December. 'This should be discussed,' the member of the CDU governing board told Reuters on the condition of anonymity. CDU leaders will meet next Sunday to prepare for a summit in December where party members will vote for a new chairman. 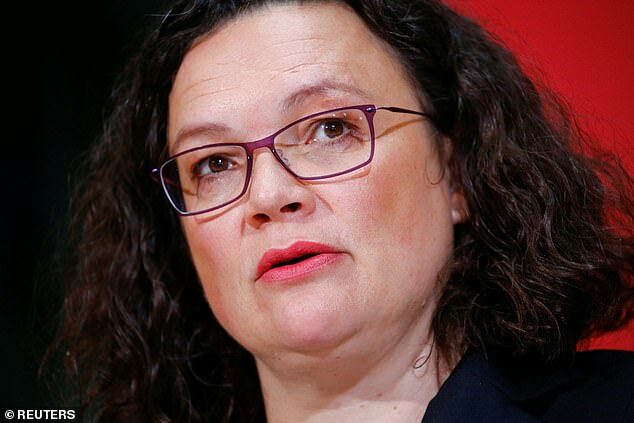 Nahles is also feeling the heat from SPD members still disgruntled with their leaders' decision to join Merkel instead of fulfilling an election promise to sit in opposition if they fail to win the federal vote. Merkel became Germany's first female Chancellor when she was elected in 2005 (pictured), a post that she has held ever sinceNahles said on Sunday she would propose a roadmap to allow the SPD to measure the progress of the ruling coalition, which has been plagued by infighting, at a mid-term review next year. Her proposal did little to appease the head of the SPD's youth wing, who said the election in Hesse was a clear signal that the ruling coalition was not viable. The instability has further eroded the credibility of the conservatives and the SPD in the eyes of German voters, who are increasingly turning to smaller parties on the right and on the left. Born in West Germany in 1954 to a German father and Polish mother, Angela Kasner - as she was then known - was taken to East Germany just three months later after her father received a pastorate in Perleberg. Her first brush with politics came when she joined the Free German Youth, the communist youth movement of East Germany, in 1968 - though membership was often required to get into higher education and it does not appear that she was seriously political as a youngster. In 1973 she went to study physics at Karl Marx University, in Leipzig, where she also met and married husband Ulrich Merkel in 1977. She graduated in 1978 before pursuing a career in academia. 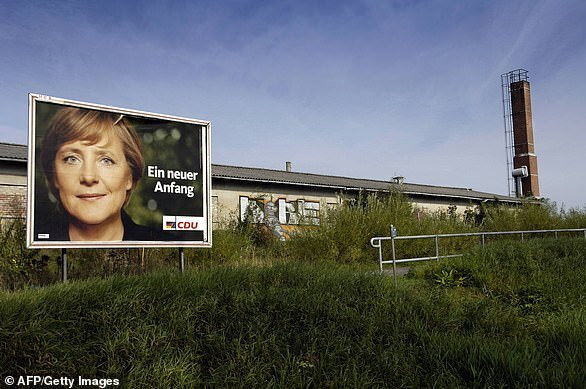 It was the fall of the Berlin Wall in 1989 that spurred her into politics. Having watched the wall fall she joined a new political party called Democratic Awakening and became deputy spokesperson of the government following the 1990 elections. 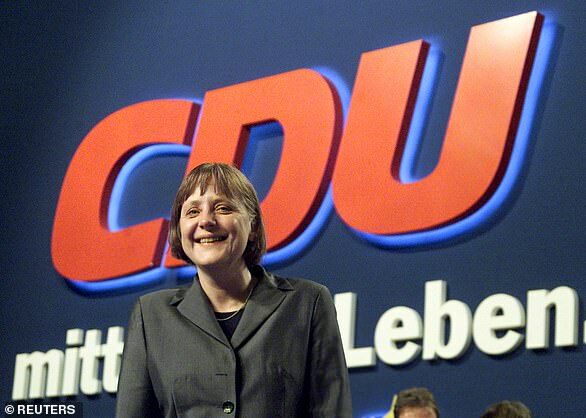 In April of that year her party merged with the CDU, and after reunification she was elected to the Bundestag as the representative for Stralsund. 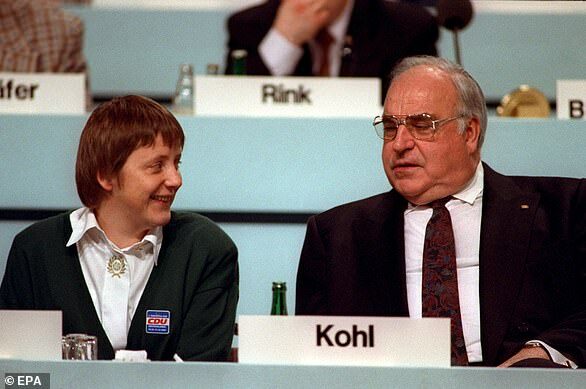 After picking up two ministerial appointments she took control of the CDU in 2000 following a finance scandal in which she criticised her mentor Helmut Kohl and called for him to leave. In 2002 she became Leader of the Opposition in the Bundestag before the 2005 election, which - after a close result and weeks of negotiation - ended with her becoming Germany's first female Chancellor. During her tenure as Chancellor she has become known as the de-facto leader of the EU, as well as a globalist who has advocated in favour of free trade agreements and green energy. In 2010 she became known as the austerity Chancellor when she demanded that Greece implement strict budget-cutting measures in the midst of the Eurozone crisis - a move which saw effigies of her burned in Athens. But perhaps her most infamous moment came in 2015 when she threw open Germany's borders to migrants from sub-Saharan Africa and the Middle East, declaring 'we can do it'. In the course of a year, more than 1million people arrived - often undertaking dangerous boat rides across the Mediterranean to reach Germany - which has spurred social unrest ever since. The anti-immigrant AfD has since entered the German parliament and all state assemblies, costing the CDU and coalition partners CSU millions of votes. After the last election it took months for Merkel to cobble together a grand coalition with the SPD, which has been plagued by instability and in-fighting ever since. Following a bruising election result in Hesse at the weekend - in which the CDU won but dropped 11 points at the polls - Merkel seems to have decided that the time has come to step aside. And hopefully the next government that comes in will see the treason she has committed upon the German people, arrest her, try her, find her guilty and have a public execution, showing that treasonous politicians are NOT above the law.